Congratulations to Realtor Rita Boswell on making the Top 1% of real estate agents in the Columbus area on HomeLight! HomeLight makes the process of finding a great real estate agent easier. They use client reviews and actual sales data to match home buyers and sellers with the best real estate agent for their needs. 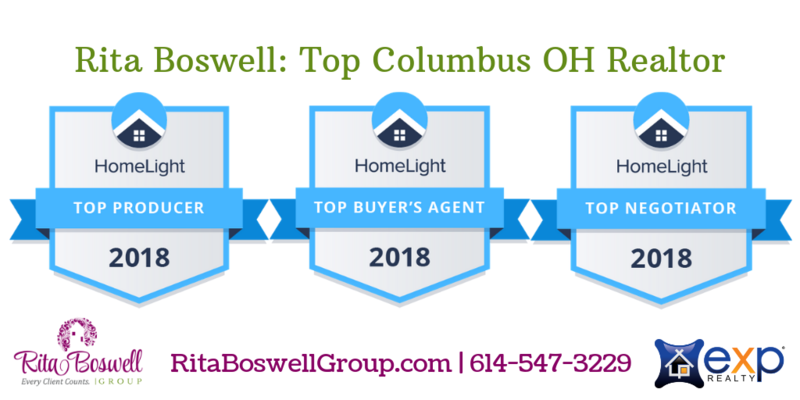 Based on sales and excellent client reviews, Realtor Rita Boswell is a Top Columbus OH Realtor! Specifically, Rita Boswell is the best Realtor to call if you need a Buyer’s Agent and/or skilled Negotiator. Plus, she’s a Top Producer, which means she has a lot of experience. Top Buyer’s Agent is awarded to real estate agents who rank in the top 5% in their area for the total number of completed buyer side transactions. Top Producer is awarded to agents who rank in the top 5% in their area based on total sales volume. Top Negotiator is awarded to agents who save their clients money on home purchases. It is given to the top 5% of agents in their area, and it is based on the sale to list ratio for buyer side transactions. It’s no surprise to those of use who work with Rita Boswell. We know how dedicated she is to providing unsurpassed service to every client. How does a Top Producing agent also provide outstanding, personal customer service? Realtor Rita Boswell makes sure each client receives top-notch service throughout the transaction and beyond. She has a client-centered approach to real estate, and she leads by example. Rita Boswell’s many five-star reviews reflect this dedication to her clients. At the Rita Boswell Group we are focused on providing a jaw-dropping experience for our clients. It takes a number of people to make a real estate transaction a success. From the lenders to the title agency, Rita Boswell personally strives to make sure her clients are working with people who will provide the best possible experience. If you’re thinking about buying or selling a home in Central Ohio and you want to have a great experience, call Realtor Rita Boswell at 614-547-3229 to get started.